Ages 10 through 17. 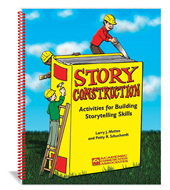 Help students develop skill in sequencing story information and in constructing their own stories using the high interest, reproducible activities in this book. Story sequencing activities are included in which students retell short stories that contain between 4 and 12 pictures. Students are also able to create stories that continue to grow as they combine pictures in a variety of ways. Both oral and written language activities can be presented using the materials in this book. All activities can be presented orally to nonreaders. Sequencing Stories. The stories can be presented orally by the instructor or read independently by the student. The student's task is to expand each story by adding story events, describing the story setting, etc. Finish the Story Worksheets. Each of the story worksheets includes a picture and a story starter. The student's task is to finish each story. Story Game Card Activities. This section includes game card activities designed to stimulate creative storytelling. The activities can be modified and expanded in a variety of ways for use with students. A downloadable version of this product is also available (see RELATED PRODUCTS link below).